Your sign is about beauty in its many forms. No matter what a Libra does, it’s got the intention of elegance. Everything is considered in terms of its presentation, which is not at the expense of quality; the presentation enhances the quality and vice versa. But appearances count, and you’re unlikely to respect anything that’s not done both with care and the appearance thereof. That also means you can hold yourself to a high standard and push yourself in a way that you rarely reveal to others. Their criticism can seem harsh to you because you’ve likely already seen any issue that someone points out and have addressed it in your own quiet way. Libra holds space for an ideal that can only be emulated on this plane of reality. Nothing quite lives up to it; that may be the reason for the famous quality of ‘indecision’ behind your sign. You recognize that there is no perfection, and alternates all have their advantages and disadvantages. The most important thing you can learn is how to decide, and most often you do that on a gut level. You ‘just know’ something and sometimes you think you’re a bit psychic as a result. Your outer appearance is often deceiving in that it veils your inner intensity. I call Librans the ‘human blowtorch’, because you can be cool, calm and quiet, and then turn into creative powerhouses when you are motivated to turn up the gas. 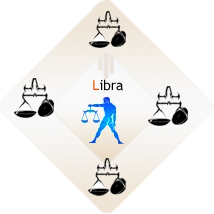 Libra is the sign associated with the concept of justice, which is the meaning of the scales. You have a sense of fairness and equanimity that is alien to many people around you. Yours is also one of the primary signs associated with relationships and relating, which are important priorities for you and which must be conducted in the spirit of ethics and integrity. If someone is dishonest, don’t convince yourself to trust him or her. At the same time, you must remember not to get lost in your relationships — and remember how to find yourself again when you do. Libra is a cardinal sign, coming at the change of a season, though the initiative of this sign can take some time to come out. Libra is associated with the planet Venus, and Saturn is well-placed here as well. If you want to know more about yourself, study the positions of these two planets. Venus is likely to be close to your Sun, and Saturn could be in any sign. Most of the signs have one dominant ruling planet that has survived as a carryover from traditional astrology — though Libra has two. Venus is about values and Saturn is about structure and form. To work your astrology, study and learn to master both of these planets. Hour 1 2 3 4 5 6 7 8 9 10 11 12 Minute 0 1 2 3 4 5 6 7 8 9 10 11 12 13 14 15 16 17 18 19 20 21 22 23 24 25 26 27 28 29 30 31 32 33 34 35 36 37 38 39 40 41 42 43 44 45 46 47 48 49 50 51 52 53 54 55 56 57 58 59 A.M. P.M.